Note: The ability to sell Self Fulfilled products is available only to Pro and Advanced plan subscribers. What are Self Fulfilled products? There are three different kinds of products that the photographer can sell through their website. Partner Vendor Fulfilled Products - These are products that are automatically fulfilled by one of our partner labs. Click here for more information. Digital Download Products - This allows you to sell digital copies of your images that clients can download for a fee. Click here for more information. Self Fulfilled Products - These are products that are directly fulfilled by the photographer. When a Self Fulfilled product is ordered, the photographer will place the order for the products from their lab of choice. They can then ship the order directly to the client. This allows the photographer to offer products for sale through their site that may not be available through any of Zenfolio partner labs. It also allows the photographer to sell products from a lab that is not a Zenfolio partner lab. Self Fulfilled products can also be used to offer services for sale. Example services that can be sold as Self Fulfilled products include photo sessions, photo retouching, gift certificates, thumb drives, etc. If you decide to create and fulfill your own self-fulfilled products, Zenfolio will take orders from your clients and forward them to you. You will need to collect payment, and fulfill orders directly. Payments can also be accepted using PayPal. The responsibility is with you to communicate with your customers and to provide customer service. You also have the option of offering your self-fulfilled products in one of 19 supported currencies. Click here to watch a video tutorial on setting up Self-Fulfilled products. Click here for more info on what happens after an order for Self Fulfilled products is placed by a client. Before selling a Self Fulfilled product, the photographer must first create the Self Fulfilled product in their account. This allows them to specific exactly what product is being offered for sale. For example, if the photographer is offering a one hour photo session for sale, creating a Self Fulfilled product called 'One Hour Photo Session' would help ensure that the client is aware of what they are purchasing. It's important to define each photo product by using a representative product image and give it a good description. You can require a minimum photographic resolution if necessary. For example, if your photo product is a 40x60 inch poster, then the image used would have to meet the minimum photographic resolution for that product. You can also specify aspect ratio for cropping. This is used to maintain product dimensions when a photograph is cropped so that parts of the image aren't lost. If the final product is usable when oriented both horizontally or vertically, then allow to rotate cropping rectangle. Once you have created your self-fulfilled products, you can edit and delete them at any time from the self-fulfilled products list. *Also - once you have created your Self-fulfilled Product(s) and defined the shipping category you will also need to create a Shipping Method that corresponds with your products. Please see the the Shipping methods instructions for the steps on creating your applicable shipping methods. In the Dashboard, click SELLING from the main menu. 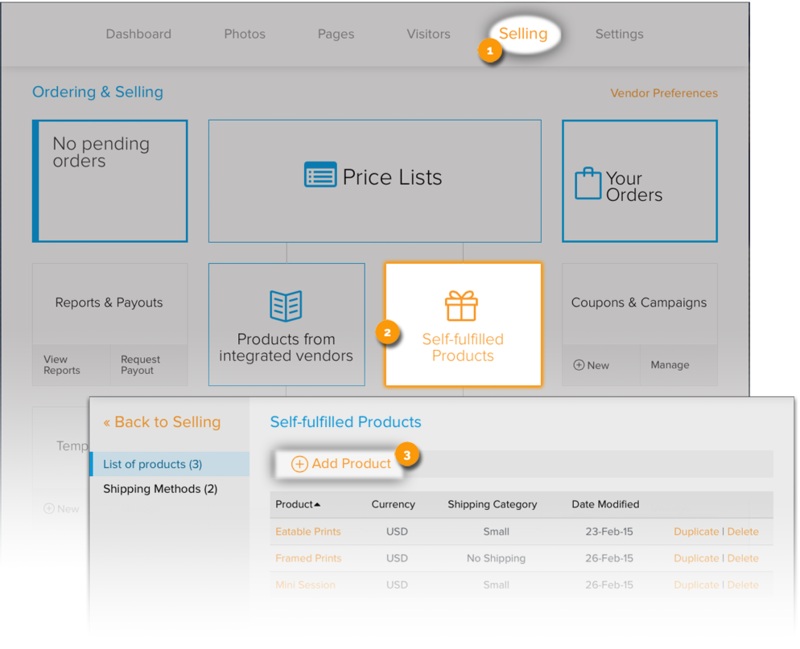 Click Self-Fulfilled Products in the main area. A new window will load. Enter a Title, Product type, Product ID (if applicable) and Description for your product in the text fields provided - also here you can determine whether customers can leave a note when purchasing. Select the product currency you would like to assign from the drop-down menu and type your base cost (optional) in the text field provided. Note: Base cost is not the price you will be charging customers. It is your internal cost to help calculate profits in the reports. You will set the actual price of this product when you add it to a price list. Choose the category or categories where you would like the product to appear in. Select as many categories options as necessary then click Select. The category options you have selected will appear in the category window. By default Other Products is an option. Note: If you don't upload an image then the default 'package' icon will be used as a placeholder. Set the Minimum and Maximum number of photographs that can be used for this product under Number of photos required for the product. Click the Require minimum photo resolution box (optional). Type the Minimum Horizontal Resolution in the text field provided. Type the Minimum Vertical Resolution in the test field provided. You will now only be able to use photographs at this resolution or above. Click the Specify Aspect ratio box (optional) Type the aspect ratio parameters in the text fields provided. Click the Allow to rotate cropping rectangle box (optional). Select the Shipping Category for your product by clicking the size of the packaging it will need. When creating products that are not intended to be shipped you can determine this by selecting This product has no shipping. Click Save. Your product will be added to your Custom Product list. *IMPORTANT! Once you have created your Self-fulfilled Product(s) and defined the shipping category you will also need to create a Shipping Method that corresponds with your products. If you plan to offer products that you will be fulfilling directly, you may need to specify applicable shipping methods. This could be a method such as US mail, UPS Ground, FedEx Next Day, etc. Each product you offer can belong to a shipping category, and you can specify a shipping method(s) for each shipping category and destination. An applicable shipping method for an order that contains Self-fulfilled Products would be able to accommodate every size of the products that might be ordered by your customers. For example: If you have various Self-fulfilled Products that ship in a small, medium and large packages, in order for the system to calculate the proper shipping cost, there would need to be a shipping method which accommodates for small, medium and large items. You can create or delete shipping methods at any time. Click Self-Fulfilled Products from the main area. Click Add Shipping Methods. A new window will load. Type the Shipping Method Name in the field provided. This name will be visible to your customers. Also choose the Currency from the dropdown menu options. If you are using multiple package sizes, you may want to indicate the number of smaller packages that fit inside the next size up. *A self-fulfilled product is only designed to use one package size. By entering the number of smaller packages that will fit inside the next size up, an order for that product will be able to ship using that next size up when warranted. Under This shipping method delivers to the following destinations, click to highlight the name of a country you can deliver to press Add. The country will be added to the Selected Countries box on the right. Repeat this action until you've added all of the countries you can ship to. When you set the number of items that fit into larger packages (Large, Extra-large and Bulky), the system will automatically calculate the correct number of smaller packages that fit inside based on those quantities. To offer the Self Fulfilled products for sale, you'll need to add the Self Fulfilled products to your Price Lists. Unlike Partner Vendor Fulfilled product and Digital Download product orders, the client pays the photographer directly for the all Self-Fulfilled product orders. So when a Self-Fulfilled product order is cancelled, Zenfolio will not be able to provide a refund to the client. Since the payment was made directly with the photographer, the photographer is the one that must provide the refund directly to the client. 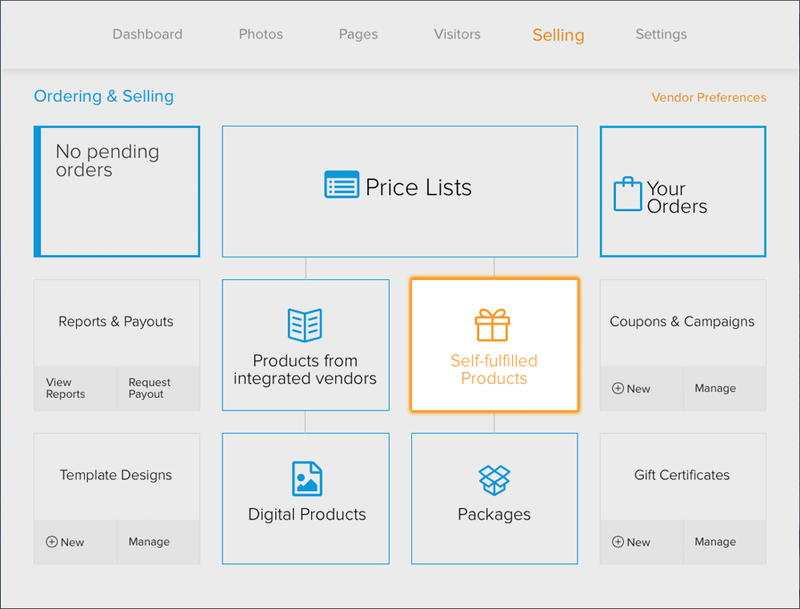 For Partner Vendor Fulfilled product and Digital Download product orders, the service fee charged by Zenfolio when the order was placed is refunded back to the photographer when the order is cancelled. For Self Fulfilled products, the service fee is not refunded when the order is cancelled. Unlike Partner Vendor Fulfilled and Digital Download orders, the payment for the order is handled outside of Zenfolio. Because of this, Zenfolio does not have a way to verify that the order was truly cancelled and that a refund was provided to the client.